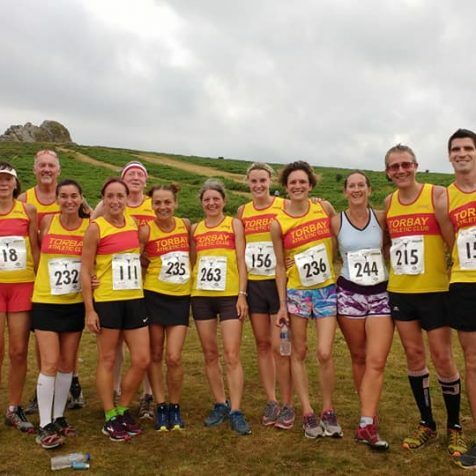 Twelve Torbay AC members ran in the Chudleigh Carnival 6 which started outside the Bishop Lacy Public House, completing a small loop around the town centre before winding its way up (a mile long climb) and along the Chudleigh ridge, dropping back down into Chudleigh where there were 187 finishers. Leading in many younger men and first home for Torbay in 5th place, was V50 Super Vet. Pete Monaghan (32:27) followed in 10th position by U18 Shaun McKernan (34:55), 12th Martyn Breslan 2nd U40 (35:33), 13th Kevin Fine (35:36), 62nd Steve Lister 2nd M60 (43:26), 65 Steve Wilbraham (44:03), 71 Cassandra Harrison 2nd FV40 (44:32), 83 Nick Dance (46:30), 118 Irene Hewings 1st FV60 (50:05), 171 Ray Wilson 2nd 65+ (59:47), 180 Gemma Radcliffe (1:03:01). 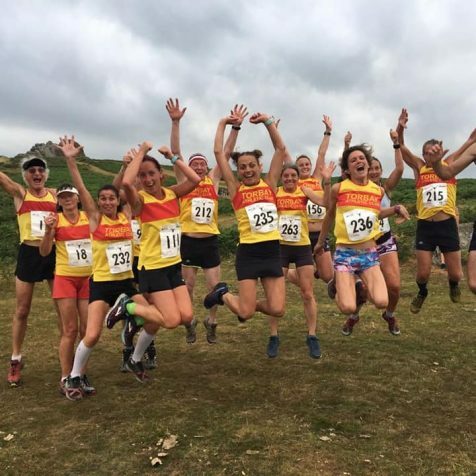 At the aptly named Haytor Heller a tough 6 mile off-road event, not for the faint hart-ted, fifteen Torbay AC runners competed with several awards being won for outstanding performances. Starting below Haytor Rock the route followed a hilly, single lap route to Hound Tor, before returning up to Haytor Rock with a fast downhill scamper to the finish for the 229 runners. Last Wednesday evening Pete Monaghan, Ray Wilson and Gemma Radcliffe ran the Exeter 10k. A great 2 lap traffic free pancake flat 10km run on footpaths and cycle tracks around the River Exe and Exeter Canal. Pete Monaghan 1st MV50 finished 4th in (35:12) with Ray Wilson 1st MV70 280th (63:39) Gemma Radcliffe 25th F35 307th in (66:17).